While the tool might not make the data analyst, having good ones at your disposal sure can't hurt. Check out these great options. The amount of data produced by humans has exploded to unheard-of levels, with nearly 2.5 quintillion bytes of data created daily. With advances in the Internet of Things and mobile technology, data has become a central interest for most organizations. More importantly than simply collecting it, though, is the real need to properly analyze and interpret the data that is being gathered. Most businesses collect data from a variety of sources, and each data stream provides signals that ideally come together to form useful insights. However, getting the most out of your data depends on having the right tools to clean it, prepare it, merge it and analyze it properly. Here are seven of the best analytics tools your company can take advantage of in 2019, so you can get the most value possible from the data you gather. If you need a powerful yet flexible solution for your overall analytics, Sisense represents a compelling fit. The company’s platforms offer a variety of visualization and data analysis tools, including dynamic dashboards and highly customizable data structures known as Elasticubes. Sisense also supplies powerful data scrubbing and prepping tools, empowering you to focus on uncovering results by easily running ad hoc queries using natural language and even voice interfaces. The Sisense ecosystem delivers a variety of statistical tools including variance, correlations and regressions. Furthermore, Sisense is capable of outfitting clients with higher level tools that include the ability to embed its tools in your own product, or to create customizable dashboards that can be specifically designed for every department and even each team member. Google Analytics may be the best-known name in web analytics, but Clicktale is rapidly emerging as a reliable competitor. The company distributes a web analytics platform that offers behavioral analysis as well as a variety of optimization tools designed to assist businesses with improving the flow of their websites. The company’s tools include path analytics, which enables clients to effectively track exactly which path users take through a website, including the highest concentrations of clicks, areas that are skipped over, and more. Additionally, Clicktale measures users’ behaviors to personalize their experience while helping you optimize your website to meet your target demographics’ needs more successfully. Your company’s content strategy is an increasingly important part the marketing budget, with the focus on generating conversions and driving engagement. Oribi offers an easy-to-use and efficient way to track the flow of new visitors to your site, as well as how people interact with the content you create. Oribi is capable of tracking specific goals by referral channel and content type, including blog posts, videos, and social media. The platform can assess specific metrics, including signups, downloads, reads, as well as unique views. More importantly, Oribi tracks users’ views of your website by scanning where they arrived from, what they’re visiting, and how they behave on each web page. As opposed to other platforms, which require manual setup of the micro-conversions you want to track, Oribi features a smart suggestion engine, which recommends “events” for tracking, based on the patterns it notices. The company’s analytics give you excellent feedback for optimizing your user experience and understanding your biggest sources of traffic. 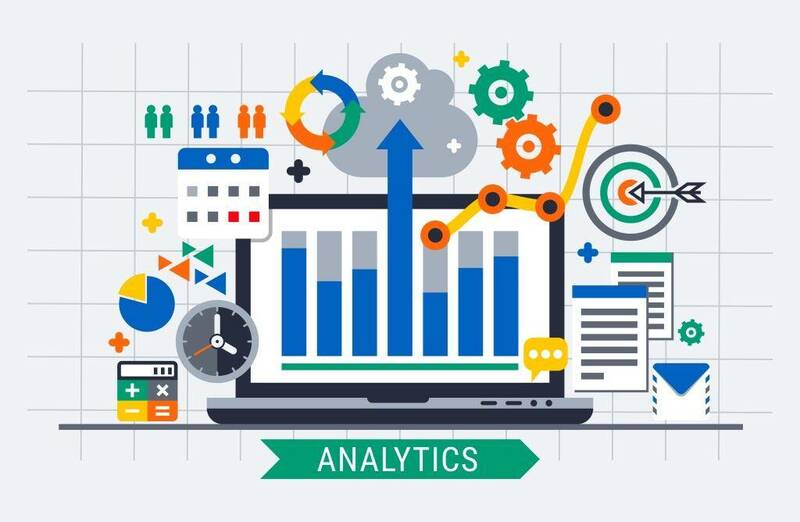 Every industry has its own analytics needs, and tools that perform exceptionally well for marketing and social media may not be ideal for more intensive analytical and processing needs. DataMelt is one of the most popular and powerful analytics tools for the hard sciences. The platform is used extensively for mathematics, engineering, statistical analysis, and even financial market modeling. DataMelt is fully customizable and features a massive library of tools made available through dynamic scripting. This includes over 40,000 Java classes and 500 unique Python modules that can be implemented in any analysis. More importantly, DMelt, as it’s known, supports a variety of languages that grant it a high level of customizability that is perfect for matching the specific needs of many sectors. While analytics can convey an important story relating to various aspects of your organization, keeping tabs of each specific data stream can get complicated if they’re not carefully organized. Cyfe, an all-in-one business dashboard, supports a central location to keep tabs on every data stream your company may record. Instead of placing different channels on individual streams, Cyfe creates comprehensive dashboards that can cover several channels with dozens of available pre-built widgets. In addition, you can build your own widgets to connect with additional sources, or use the API. Users can design their own dashboards for access via the web app, but they’re also embeddable on any web page, while “TV mode” features a layout optimized for streaming to the big screen on your office wall. You can also set up mobile alerts so you know when certain thresholds are crossed, and even create data mashups to provide more in-depth analytics and insights. Marketing decisions are increasingly data-driven and require an unprecedented level of insight in today’s online ecosystem. Kissmetrics, founded by marketing guru Neil Patel, offers a full-stack marketing analytics solution that specializes in improving customer engagement. Kissmetrics provides marketing funnel-based analytics and cohort analyses along with easy integrations with your existing tools, so you can act on the insights you derive. The company also supplies behavior-based automation tools for segmenting audiences and executing email marketing and ad campaigns. This expedites the marketing process and helps drive engagement by providing paying customers and prospective consumers with the information and message that is deemed most suitable. Content strategies are judged not on how much is produced, but how each piece of content and marketing materials performs in terms of search engine visibility, conversions, and much more. Tracking KPIs and metrics for content and SEO strategies drives spending decisions which must sometimes be modified on the fly. SEMRush offers a suite of analytics tools focused specifically on search. The company’s platform includes SEO tools that perform audits, provide backlinking analytics, and aids organizations seeking to develop clearer keyword and SEO strategies. Additionally, it helps companies inspect the status and success of their paid traffic as compared with organic keyword performance. These analytics are also available for any site on the web, so marketers can track competitors as well. Understanding your company’s data is a vital concern. Deploying any of the tools listed above can position your business for long-term success by focusing on areas of achievement and improvement.